So, 0.14 is soon to be coming out; there is a Tournament before the release. Any of you guys interested in forming a clan for it? I have never actually managed a win on CAO, but I'm willing to associate myself with a theoretical TT team, since as far as I can tell, there's no way I can actually drag the clan down. I've never even played online, but I might if there was a TT team! The best thing about Sprints is the ability to get level-9 spells up and running halfway through. Fire Storming the bees in The Ten Rune Challenge is not only hilarious overkill, it's free MP-wise with Vehumet! I currently have this character saved in the Zot part of the map. Looking pretty good! Everything's dead except Dispater, who is really good at eating Fire Storms but also very easy to run from (and subsequently gank his rune). Playing a DDWA of Okawaru for kicks in C-Light, and he's giving me actual legitimate good things. Like boots of speedrunning and gauntlets of strength! I'd join a TT team. He will do that from time to time. Then, the next game, he'll give you a +0 cloak and some horrible artifacts. I got a highly enchanted artifact demon whip with all sorts of useful other stuff on it once -- on a 1H M+F user to boot! I'm thinking of giving DCSS a try, since I apparently need 3 or 4 roguelikes to bounce around when I get bored or frustrated with one. But do people have opinions on how they'd rank the classes/races? Minotaur Fighter. Possibly the easiest early game of all. Go Trog or Okawaru, bash things, and never look back. Centaur Hunter. Basic ranged build. Extra speed helps a lot when running. I'd again suggest Trog or Okawaru for lots of nice ammo. Deep Elf Conjurer. Standard "blast things" build. A little tougher to get off the ground, since you're so darn frail at the start, but unparalleled offensive power. Spriggan Enchanter. Standard stabs and stealth build. Great at stabbing things to death early, which is lots of fun when it works, but a little rougher when things wake up. Spriggans being really, really fast helps. You need to figure out something else to do late game, but that's probably not a concern your first few. Troll Berserker. Use claws, berserk a lot, and later on, spam your summons from Trog. Probably an even easier early game than Minotaur Fighter, but not as strong later on. Others may differ, but those are the ones I'd start out with. Then you can branch into other things as you get more comfortable with the game. Sorry to spam the thread, but I beat The Ten Rune Challenge again! And in 0.13 this time! Dungeon Sprint DCSS version 0.13.1 (tiles) character file. Began as a Deep Elf Conjurer on Apr 7, 2014. ... and 10 runes on Apr 8, 2014! The game lasted 02:37:35 (26011 turns). You collected 7541 gold pieces. You spent 4987 gold pieces at shops. Your orb of destruction hits a rock wall. You are contaminated with residual magics. The dungeon shakes, a horrible noise fills the air, and a portal to some otherworldly place is opened! Zeopp sneers, "I shall feast on thy head!" Zeopp hits you but does no damage. 0 | D        | Zanzibar, the Deep Elf Conjurer, began the quest for the Orb. 358 | D        | Found a radiant altar of Vehumet. 358 | D        | Found a deep blue altar of Sif Muna. 358 | D        | Found an ancient bone altar of Kikubaaqudgha. 491 | D        | Found a white marble altar of Elyvilon. 491 | D        | Found a glowing golden altar of the Shining One. 491 | D        | Found a glowing silver altar of Zin. 508 | D        | Found a snail-covered altar of Cheibriados. 511 | D        | Found a blossoming altar of Fedhas. 511 | D        | Found a basalt altar of Yredelemnul. 512 | D        | Offered knowledge of Shock by Vehumet. 699 | D        | Found an iron altar of Okawaru. 699 | D        | Found a bloodstained altar of Trog. 707 | D        | Offered knowledge of Flame Tongue by Vehumet. 925 | D        | Found a shimmering altar of Xom. 925 | D        | Found a burning altar of Makhleb. 926 | D        | Found a sparkling altar of Nemelex Xobeh. 990 | D        | Offered knowledge of Stone Arrow by Vehumet. 1217 | D        | Offered knowledge of Throw Icicle by Vehumet. 1368 | D        | Offered knowledge of Inner Flame by Vehumet. 1449 | D        | Offered knowledge of Bolt of Magma by Vehumet. 1631 | D        | Found Stegull's Jewellery Emporium. 1709 | D        | Offered knowledge of Orb of Destruction by Vehumet. 2420 | D        | Offered knowledge of Force Lance by Vehumet. 3308 | D        | Offered knowledge of Lee's Rapid Deconstruction by Vehumet. 3533 | D        | Offered knowledge of Ozocubu's Refrigeration by Vehumet. 4068 | D        | Offered knowledge of Bolt of Cold by Vehumet. 4577 | D        | Offered knowledge of Bolt of Fire by Vehumet. 4970 | D        | Offered knowledge of Lehudib's Crystal Spear by Vehumet. 4970 | D        | Offered knowledge of Fire Storm by Vehumet. 4970 | D        | Offered knowledge of Shatter by Vehumet. 5188 | D        | Found Kevys' Book Shop. 5189 | D        | Found Idac's Distillery. 5193 | D        | Found Idohoyw's Antique Armour Boutique. 5828 | D        | Found Deviohez's Jewellery Shoppe. 5828 | D        | Found Mnaloix's Antique Armour Boutique. 6043 | D        | Found Pheag's Magic Scroll Emporium. 7186 | D        | Found Stext's Food Emporium. 7186 | D        | Found Striocs' Antique Armour Boutique. 7186 | D        | Found Hies' Magic Scroll Shop. 7186 | D        | Found Omesuetoepn's Magical Wand Emporium. 7186 | D        | Found Riahin's Jewellery Shoppe. 7186 | D        | Found Anatz's Distillery. 7186 | D        | Found Stoux's Book Emporium. 7186 | D        | Found Klaexkia's Book Shop. 7186 | D        | Found Qengey Meza's Antique Armour Boutique. 7186 | D        | Found Biadionn's Antique Weapon Emporium. 7186 | D        | Found Ejaaj's Distillery. 7186 | D        | Found Fetagaha's Book Shoppe. 14363 | D        | Found Skamp's Armour Shop. 14453 | D        | Found Quhusu's Magical Wand Shop. 14453 | D        | Found Iliba's Distillery. 14454 | D        | Found Jias' Armour Emporium. 14871 | D        | Found Duawky Geof's Magical Wand Boutique. 26011 | D        | Escaped with the Orb! The run to the exit was surprisingly eventful. I had to use pretty much every trick I could think of to get there. Early on, I got on the other side of a door from a Shadow Fiend and took turns opening/closing it until my MP was completely regenerated; later, I was beating things to death with my staff of fire, tunneling holes in the walls with OoD to get around things I couldn't beat up, blowing things away with fans, and eventually just hasting myself and running. I thought for sure the Pan lord I encountered near the exit would get me, but my 13 AC (I think?) saved me. That was exhilarating! Now to try beating more Sprints and/or the actual game! I'dd add to those Gargoyle Fighter (like Minotaur, but trades some offense for defense), Centaur Hunter (swift movement and great ranged damage), and Kobold Berserker (like troll, but food is less of a concern and you have better armor choices). Who do you think is the best god, guys? I sorta like Ashenzari... I'm a sucker for easy identification, and since Crawl's ID game pretty boils down to using scrolls of ID or use-ID'ing otherwise, it's a pretty big advantage. Also, Ashenzari manages to be edgy without being all bloodykill deathtacular gorefest like Trog or Ydremenul... the guy's chained to the sky for all eternity, Prometheus-style; try to tell me that isn't metal. I have never used Ashenzari. I'm partial to TSO, myself, at least for melee tank characters. Fedhas. Insta-mulching mummies, whaaaat. Peaceful oklobs is just gravy. No but seriously, Dithmenos is pretty cool. I'd join a TT team, but I can't make any promises that I'll actually be able to play during the tournament. It's not exactly great timing for me. I think people typically rank the "pure" builds as the best -- see the High Elf Skald in the current LP for why hybrid builds are more difficult, especially in the early game. I'd say hybrid fighters are definitely better in the long run, but it's much, much better to focus on one thing for most of the game. The Gargoyle Skald that I 15 rune'd wasn't casting at all until around Vaults maybe? I was wearing platemail for the entire game before that, and the only reason why I started Skald was because I wanted to guarantee that I'd have their starting spellbook. So it's actually good? Kalir just got finished talking about how bad it is. Goes to show you can get very different opinions about everything. Which spells do you really like from it? I still think, for the purposes of the original question, pure characters are much better for beginners. Heck, I've played a ton and I'm still terrible in the early game with hybrid characters. I'll have to try your specialization suggestion. The distinction is that early game is where hybrids suffer most. None of your essential tools work, especially compared to more straightforward builds. It doesn't help that most warrior-mage backgrounds have terrible starting spellbooks. If you want to hybrid, try playing as a warrior or mage class, then obtaining a tool or faith to get around this weakness, like a gladiator of Vehumet. I like Shroud of Golubria, Regeneration, and Spectral Weapon. I mostly wanted the book for Spectral Weapon, since that was a really rare find at the time if you didn't start with it. It's definitely pretty rough if you're actually trying to level up and use everything in the beginning, though. And yeah, pure characters are definitely better for beginners. It's just that you'll end up with more experience than you'll ever need for just the physical skills, so you might as well start getting some utility spells eventually. Take a look at this guy, for example. I didn't really skimp on the physical side of things, and I still ended up able to cast Silence with a 1% failure rate in Fire Dragon Armor. Also, I would highly recommend some extreme specialization in the early game even with a pure physical character. Getting a few points in Armor, Dodge, or Fighting doesn't really have a significant impact on your survival early on. They mostly just slow down your weapon skill's progression, which does have a very noticeable effect on the game. Every meathead character I play, I just turn off everything but the weapon until I get to ~12-14 with it. At that point, attack delay with a one-handed weapon is at or close to the minimum, and I could switch to a two-hander without it being dangerously slow. Either way, things are dead faster, which I think is the most reliable defense in this game. I'll start raising Armor and etc after that, but I'll still keep the weapon skill going if I'm using a slower weapon. That orc up there is a good illustration of this. 19 in axes before Lair! Regeneration is legit good. Shroud of Golubria I can accept is decent, but the built-in finicky failure effect does nothing to endear it to me. Spectral Weapon I have had little opportunity or reason to use. None of those three is something I'd want to guarantee my character to have access to, especially when compared with other possible starting spellbooks. The Gargoyle Skald that I 15 rune'd wasn't casting at all until around Vaults maybe? In a properly designed class, your starting gear is what helps you survive through Lair, not something you take in lieu of another class because you want it in the late game. If the optimal Skald play is to just play as a Fighter until late, the class is even more inane than I thought! I'm seriously trying to refrain from needless DCSS bashing in this thread, but... I can't even. Ok, I named the team TalkingTime. If you guys want to be on the team, post or PM me your account name on CAO or wherever you play, the team captain has to have your guys name in their RC file. Skald can play perfectly fine even with magic being a delayed focus. Light-armour oriented builds should use the starting book spells immediately, and decent weapon skill versus available weapon doesn't take up the entirity of experience provided between D:1 and Lair:8, or sometimes even by the Lair entry. The perpetual principle of gaining killing capabilities before seeking not-getting-killed capabilities, early skills-wise, doesn't disappear just because of the hybrid status; skald is in fact one of the best examples of the archetype, not needing broad xp investments like transmuters or using cross-purpose capabilities like constantly-re-proposed reavers. Spectral Weapon is a substantial direct damage increase with unique purpose and role in positioning. For people lazy about properly using it, cleaving and reaching make it easy to use, and the drawback of potential extra damage actually exists. It is lauded as the entire reason for the Skald book to now exist as it does, and defines the class; I've even used the level 3 spell later on conjurations-focused classes simply because of the mp conservation in smacking things with an enhancer staff. The only remotely appicable critique to the Book of Battle spells being more useful later rather than earlier is that by the nature of enemy fodder versus the ability to handle it, Song of Slaying (noise in exchange for slaying bonus per kill, capped by relative danger) becomes more viable later on. Even then, quite a few people dislike the premise of consistent added noise luring more monsters in regardless of gaining more capability to kill. Gargoyles are one of the strongest current races, so not casting for a while on a hybrid background is plausible (if not greatly logical): their innate defenses and GDR make it in fact more viable to not be in the heaviest armours while still having good defenses (even if it's possible to get insane defense in heavier armours), and thus spare experience / defense in light armour and a small bit of charms. If you want to hate DCSS, do it right: within its full context. Easy example: "nostalgia" moved from re-adding removed stuff and show silliness out of context to reverting decision replacements and show brokenness out of context. I regret working on Shrines there. Now let me continue to lurk. Huh, I'll have to try that spell out some more. 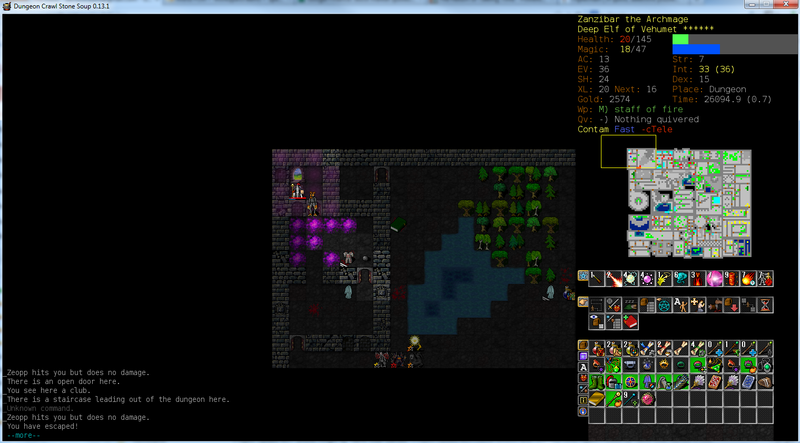 All right, my Deep Elves are getting one-shotted by hobgoblins on B1 right and left. How does the "Ouch! That really hurt!" mechanic work? Is it just basically critical hits? Does it work like SMAAAAAAAAASHes in Earthbound, where it only works with bludgeoning weapons? It merely indicates that the last hit was over 50% of your max health. Get used to seeing it with deep elves. Mogri has the right of it here. With Deep Elves on D:1, never melee except as an absolute last resort. Keep your MP full, magic dart (or whatever) things to death, and kite/pillardance to restore MP if necessary. Otherwise you can easily get one-shotted by a gnoll. Kite: Run away, occasionally sniping at the enemy. Pillardance: As with "kite," but you are specifically running around a piece of solid terrain.